Why bother with rubber backed floor mats, or deal with pricey rentals? Our Sure Stride Plush runners offer the same absorbency as traditional mats but in low-profile, disposable design making it perfect for indoor commercial applications. • Easy to install, the quick-drying PET polyester fabric allows water to evaporate quickly. 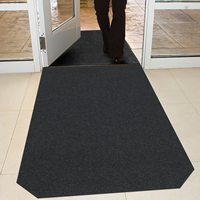 • Plush carpeting is 87% thicker and 39% heavier than the original Sure Stride Mat. 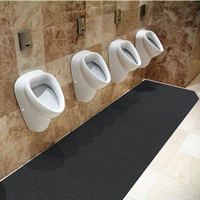 • Attractive anti-microbial treated carpet inhibits the growth of microorganisms, reducing unpleasant smells and making it perfect for restrooms. • Sustains its performance for 3 to 6 months under normal conditions before needing replacement. 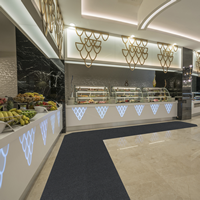 • Slip-resistant surface is certified high traction by the National Floor Safety Institute, providing a safe walking surface. • Low-profile design eliminates tripping hazards typically found on thicker mats with higher piles, making it perfect for interior entryways where door clearance is an issue. 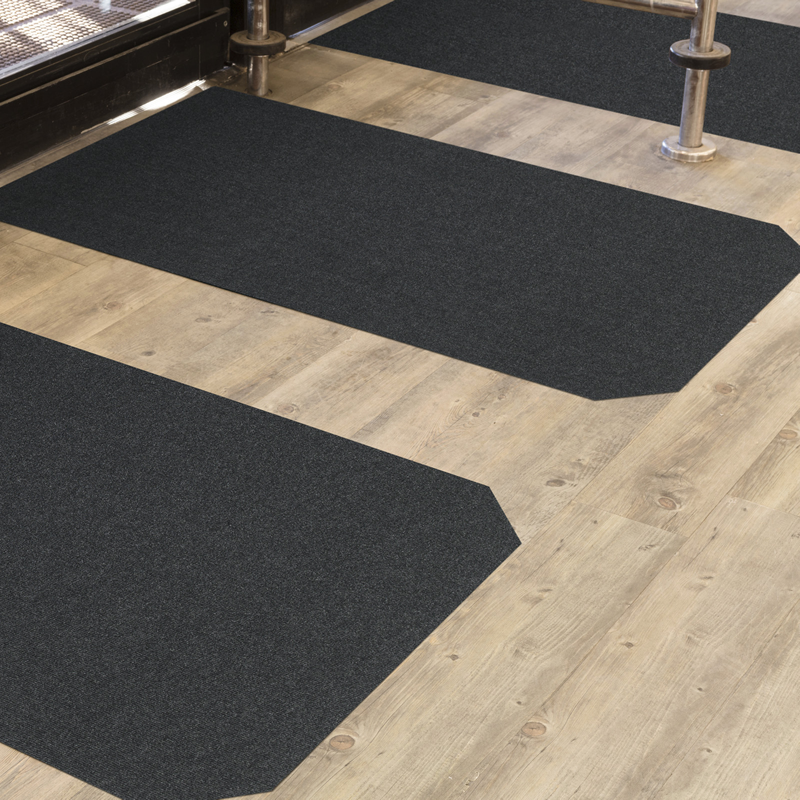 • Tacki back adhesive system keeps mats flat and in place—even with heavy cart and motorized traffic from shopping cart, buggies, strollers, hand trucks, and dollies. • Includes a cutting board and knife, a $36.00 value free of charge. 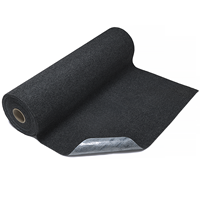 Individual mats can be cut from the roll as needed. • Ideal applications include assembly lines, machine shops, storage closets, mechanical rooms, restaurant buffet areas, produce aisles, and restrooms. • 15 ozs./sy. non-woven needle punch polyester made from 100% post consumer recycled PET fabric reclaimed from plastic bottles with a total thickness of 140 mils (.14"). • Tacki back adhesive system keeps mats flat and in place—even with cart, wheelchair, stroller and dolly traffic. • Ultra thin mat has a low profile design that reduces tripping hazards commonly associated with thicker mat piles. • A waterproof polyester film is incorporated between the non-woven PET (polypropylene) and the Tacki Back adhesive system—providing a moisture barrrier that keeps liquids from soaking through to the floor and damaging floors. • Absorbs up to 10 gallons of liquid per roll—25% more than competitive products. • Anti-microbial treated carpet surface stops the growth of microorganisms. • Recommended for commerical use on hard floor surfaces, including entrances, to prevent slips, trips and falls caused by wet floors. • Performance will last for a period of 3-6 months under normal use.